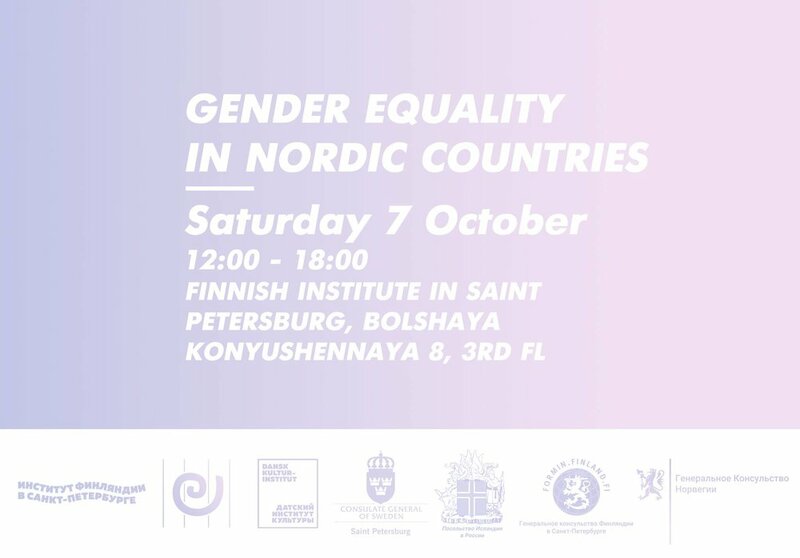 Keynote speech held at the seminar Gender Equality in the Nordic countries by the Finnish institute in St. Petersburg, Russia on October 7, 2017. Yesterday I dropped by the photography museum here in St. Petersburg and ended up browsing trough a book of old photographs. These weren’t just any photographs but the oldest type: daguerrotypes. Do you know what that is? Daguerrotypy was the first publicly available way to process photographs, invented by Luis Daguerre, a french artist and inventor in 1839. In this book was a collection of Russian daguerrotypes, from as early as 1850s’, all portraits. I have always loved old portraits, but these were special. Because of the technique many of the faces were faded and blurry. On some photos only parts of the faces were visible, others would have just a small trace of light in them, like if they portrayed a ghost of someone. The book would also feature the specialty of the time, which was photographing the dead. Looking at these pictures I had the feeling I often have when looking at old photos. I end up wondering about the people who lived lives just as full and real as us, but whose names and stories we don’t know anymore. I looked at these photos and wondered what did they dream of – what did they hope for? What kind of a society they hoped they could be living in, if they were not happy in the one they had? It is this question of dreams and hopes for a better society that I wish to discuss with you today. Because my opinion is that in the recent years we seem to have lost our vision of what kind of a society that would be. I will give you some background. When I joined the feminist movement, I joined a lineage of women who had been working for a change ever since they first fought for their right to vote. The organization I joined, Unioni, celebrates it’s 125 years in action this year – it is older than the independence of Finland, that celebrates it’s 100th anniversary. I joined the movement with hopes to see some change fast. I had experienced discrimination first hand and wanted to make the society more just, not just for me but for anyone who had similar experiences. But even if things progressed, there was a backlash, first at the end of the 1990’s, and then again after the financial crisis in 2010. It was like taking two steps forward, and one step back. Gender equality is never a straight road ahead. There always seems to be a backlash looming behind the corner, for as long as the conflict lies at the heart of who we are. Because there will always be those who are not willing to give away or share the privileges they already have. To paint a clearer picture of the dynamics that affect our struggle for equality, I would like to talk about not just our dreams and hopes, but also about the obstacles created by the political environment in which we all need to operate. To do that, I would like to point out three political trends that pinpoint both the need and the purpose for a feminist politics today. In the recent years we have seen a rise of populism, nationalism and racism all over the world. In Europe, in the United States, and in Russia. The widely shared notion of the universal human rights as a basis for any democratic society is being shaken and slowly taken apart, even abandoned. Rise of authoritarian rule and nationalism has historically been and is always linked to the limitation of rights of women, LGBTI people, immigrants and other minorities. They are made the enemy of the populist movement. In an authoritarian state the many-sided and complex social problems are dealt with stricter laws and more control – as if human life, and our need for liberty and meaningful life, could ever be controlled that way. This rise of nationalist populism has shown its power all over the developed world. In Poland and Hungary we have seen a closing of the borders to asylum seekers, restrictions of the justice system and of freedom of speech. In Warsaw and Budapest, the funding for women’s organizations has been cut off and they are now worried their operation will be forbidden altogether. In Poland, but also in Spain, Norway and Ireland, we have seen attempts to limit abortion rights. In the United States, we have a president who plays to the deepest, darkest fears of people and creates a division not only in the heart of the United States but in the entire world arena, replacing diplomacy with outright threats. In Denmark, Sweden and Finland, the previously open and liberal countries, we have seen a tightening of immigrant laws and attempts to pass legislation that clearly would violate human rights. In Russia, LGBTI people are being marginalized, advocacy groups are being silenced, and we have recently seen a law passed that decriminalizes certain kind of domestic violence. We now see russian gay and trans people seeking asylum in Finland, and this reminds me of other times, in my youth, when people would cross the same border to seek safety, but from a country that was then called Soviet Union. To protect our own humanity and that of others, we must not let the restrictive nationalist movement win, but we must rise up to the challenge of defending the human rights even louder. Any commitment to human rights only has value if and when that commitment is held up even at the hardest times. And people are committed. Women have taken to the streets in Poland, Spain and Ireland, and fought the changes to abortion laws: so far they have not passed. And yet more people have created a movement for the protection of refugees' rights, in order to help where the government aid is lacking. The Black lives matter movement in the United States is loudly opposing the practices and bias that make life harder for black and brown people. And all around the world the movement for human rights and feminism is growing. But it is of course not enough: aggression towards different minorities has increased and more and more people feel intimidated and scared about what is still to come. At a same time we see another trend, which has been amplified by the financial crisis in 2008. In a closed monetary union like EU, ability to compete is considered key. So at first the financial crisis first affected men more, as there were layoffs and unemployment rates started to rise, when a lot of the traditional labour had already been moved to developing countries. But the stated need to cut down on all costs, created room for still ongoing austerity policies: states performing cuts to services and salaries as public services and social security are seen as only costs in the countries with aging populations. So the next phase in austerity policies came with serious consequences to women and different minorities, like the disabled people and the elderly. The spending on public services that women use most has been cut, from daycare to domestic violence centers. And the cuts to salaries and pensions also affected women more as they make up the majority of public sector workers and already have lower salaries and pensions to start with. But a competition that is based on cutting down costs on what matters most to our well-being is a race to the bottom. Austerity policies have impoverished women all over Europe, from Greece to UK. It is not too far reaching to say that women ended up paying the price for preserving the competitive state system. What is worst, this does not really seem to interest anyone. When women raised their voices about what they saw was coming, no-one was listening. And now, when the results are out for everyone to see, no-one is doing anything about fixing them. Any ideas to direct funding to women specifically are met with astonishment: we cannot afford that and also, would it not be unfair to help only women? Fair question, but should that also be asked when making decisions in the first place, when those decision affect women and minorities unequally? In a competitive society values like gender equality have become obstacles to efficiency. Because gender equality always has costs involved. For example, most of the societies in the world have relied on women’s cheap or free labor. This has had consequences that keep women on the sidetrack from birth to pension. Fixing those problems means putting some money on the table. But the question of public services and social security is not only a question about women. I have learned in my own lifetime that a society can do a lot to even out the differences of background and to provide everyone equal opportunities to education, work, meaningful and ultimately happy life. This is why we must also rise up to defend the value of welfare and equal opportunities. We cannot see investment in care and public services and social support as only costs, as they are the glue that holds us together. They provide us with wellbeing and social cohesion. And updated to the varied needs of people today, they will the greatest protection against further marginalization of already marginalized groups. Thirdly, I would like to bring up a trend, which is not even a trend, but rather a stagnation. It is in the nature of gender equality that the struggle to achieve it has always been painstakingly hard. From the suffragettes who were thrown to prison, to the first named feminists who were ridiculed, there has always been a resistance to women’s vote, to gender equality, to feminism and to everyone having the same rights. Now in many states worldwide governments have taken on the job of promoting women and girls rights and non-discrimination, but this is a slow progress that is often poorly funded and politically challenged at every turn. I give you an example from Finland: with the current progress in trying to fix the pay gap, we can expect equal salaries in 70 years time. And if with the current progress in fathers using the parental leave they are given, we can expect a fare share of parenthood to happen 200 years from now. Greetings to the future, all the way to the year 2217 – we have a lot of expectations for you. It is a pity that none of us will be around to see the change. But I want to see the change! And I want to see it in my lifetime. So a few years ago I started to be frustrated at the lack of progress. It seemed like we had been fighting the same fight for 20 years. Being an activist in an NGO we were always just lobbyists, never the decision makers. And who were we lobbying? The answer: other feminists in women’s lobbies in political parties, who would then have to lobby their own leadership to accept their ideas – as more often than not, those feminists were not the ones holding the highest power in their own parties. Instead, all the decision makers looked very much the same: they were male, and they were white, and they were quite wealthy. So to have a topic about gender equality reach the highest ranks of public debate would require a male politician to take it upon themselves to promote it. Lobbying after lobbying after lobbying. Never being the one to make decisions. Not only is always being the underdog a problem, but it also displays the problem of the lack of representation. For a true democracy to work, it needs to be based on a number of different points of views and experiences. It is important to see that one of the decision makers could be someone who looks like us. There are no words to describe who much it has meant for little girls in Finland that they saw in our president Tarja Halonen that yes indeed, a woman can also be a president. So in 2014, with the frustration that I already felt with the lack of progress, with the rise of racist populism, and with the backlash in the advancement of women’s rights, I became acutely aware that we needed to start another kind of a movement. We needed to begin to protect what we had already achieved, and to drive a faster change and redefine what we needed to do. I had become disillusioned that this change could happen trough NGO’s as it seemed that the NGO’s were not really listened to anymore due to the backlash in women’s rights and human rights in general. This feeling of wanting to do more coincided with another kind of movement that was building up at a same time. The Swedish Feminist party was growing like never before, and at the same time feminism broke into the mainstream media. We got the likes of Beyoncé, Barack Obama and Justin Trudeau to come out as feminists. It seemed that feminism had finally had a certain kind of a breakthrough. And while the nationalist populist movement was pulling the society into a more authoritarian and restrictive direction, the counter-movements also gained power and started to flourish. This was a sign not just to me but to many others, that there maybe was a momentum for more ambitious feminist politics and for creating our own feminist political party also in Finland. I was at the time acting as chairwoman in Unioni, the women’s organization I mentioned and the biggest feminist organization in Finland. I started to get questions from people and the media about whether there were any plans to start a feminist party in Finland. Many seemed to hope that someone would do it, and they would jump on board as soon as someone did, they just didn’t know how to go on about it. As I was in a position to do something about it, to reach people, and as I also strongly felt something needed to happen, I contacted a few friends and sat down with them to start planning what we felt was going to be a revolution. So what did we do: we did decide to start our own political party, one year ago today. And what does it mean? It means starting a movement – providing hope for the many who don’t feel like they are being heard right now. It means challenging other political parties, demanding them to do better by showing an example and pointing out where they might not do enough. And it means defining our own agenda, making exactly the kind of policies we deem the most feminist and most efficient for reaching our goal. It meant no longer being the lobbyists. And we succeeded, already in our first year. We managed to gather enough support to register as a political party. We took part in our first election and had our first victory: we got through to the Helsinki City Council on our first try, after only two months as an official party. In Finland, this was a historically fast win that to our knowledge had never happened before. And why do I think we succeeded? It is of course evident that there needs to be a social demand to what you are doing and you need to be able to communicate it. But what I believe mattered the most, was that we managed to recreate in people a faith that politics really can be about what kind of a society we want to build and that this is something that we can all be doing. This was the message that we wanted to convey and this is where I think we succeeded. Our vision for a society is a society that is equal and does not leave anyone behind. And we believe there are a multitude of means to achieve this goal that have not yet been used. I believe this renewing of faith in politics was as important to us as it was to our voters. Without being able to address the hopes and dreams of people, without a vision of what our future society should look like, the politics seem to be only about a conflict over power and about who wins the next election. We wanted to think that it can be about something bigger and stood up for a vision of a society that we believe in. I believe that is why we surprised everyone and at the election night got a new nickname: we were now the Pink Sensation. For me politics is a new kind of an arena to further feminism. It means pointing out that our understanding of gender equality is not without conflict. These conflicts need to be made visible and then debated upon in a democratic manner – that is the beauty of the representative democracy. The main conflict is that we can all agree about the goal, but we are not necessarily in agreement about the means. Feminism is not a goal in itself, but it is a tool – a means to a goal. The goal being gender equality and non-discrimination. It is not always easy – we get challenged because we attempt to enter the arenas where we are not used to being seen. Try for example to talk about gender equality with a group of economists. But our society needs diversity and it needs more voices and experiences to be visible and heard in the political arenas if it is to survive as an open society. Now you might ask yourselves, why do I talk so much about minority rights, racism and immigration. This has to do with what feminism is today. As I said earlier: the limitations to the rights of women always go hand in hand with limitations to the right of minorities. This is because neither women nor minorities are really taking part in the decision making. And the more vulnerable you are, the more your rights mean to you. Modern day feminism is based on an understanding that no-one can be free if all of us are not free. And that many of us are often in an intersection when it comes to different reasons why we might be oppressed. On the one hand we might suffer from oppression because of our skin color. And on the other hand because of our gender. And they can exist in one person at a same time. either one of the gender binaries. Modern day feminism includes everyone. So what does the future look like. How have things changed now, does the future look brighter? Is there a turning point to be seen? There is now a feminist political party not just in Sweden and Finland, but also in Norway, and since this summer, in Denmark. There are seeds for a party growing at least in Spain and Croatia. The feminist political movement has power, because it is answering to the need of voters to place themselves not only on the traditional left-right political spectrum, but also on the liberal-authoritarian spectrum, that seems more relevant than ever in the modern society. New political parties like the feminists and the greens are movements for today. It can be called identity politics in a sense that these are the identities and bodies that have long been spoken over and left out from the political decision making: women, LGBTI people, racialized minorities, immigrants, those who do not fit the norm and those who do not look like the majority of the world leaders. But the movement that threatens these groups of people, the nationalist populist movement, is also an identitarian movement. It is a movement to protect the identities and bodies that used to have all the power, but feel lost in the modern society that no longer gives similar respect for their labour or to the traditional values that they still believe in, and that no longer values certain skin color over another. Because of this, I don’t see the populist trend disappearing anywhere soon. But given the recent elections in Europe, there is a chance that the populist movement might have passed its peak and lost some of its power. Yet we still have to solve the issues that fuel racism, sexism and homophobia and the populist movement. How do we provide a sense of identity and meaningfulness to those who feel threatened by the changes in a modern, open, pluralist society – without giving up on exactly those values? If we cannot provide the people with lost identities with meaningful answers to their fears and worries, we cannot stop the politics of hate. Anyone who would rather choose hate than love will never find answers to their worries in the simple populist slogans. This is why our feminism needs to be about listening to everyone. Those of us who have better means to do it, can be the ones offering the ear. When our fundamental values of gender equality, non-discrimination and right to live in peace and safety are challenged, we must respond with more democracy, more openness, and more humanity. Human rights do not have a value unless they are fiercely defended when they are challenged the most. The struggle is global. As I pointed out earlier, instead of openness and humanity, many countries seem to be isolating themselves and defaulting back to finding national solutions to international problems. Isolation means shutting our eyes from what is happening around us. There are currently more than 65 million refugees and displaced people in the world. This is a record number, the highest since the Second World War when the records began. People are attempting to reach safety, and they face an uncertain future with difficulties in education, employment, health and security. We see this first hand in the Mediterranean sea, which has become a grim symbol of our inability to put people first, instead of state borders and no routes to safety. The refugees are not going away. With the unresolved conflicts and the changing climate, we will be facing an even higher number of people on the run in the upcoming years. This development is not happening without us taking part in it. The Nordic countries, as well as many others from Europe to the United States to Canada to Russia, sell weapons to countries like Saudi Arabia. A country that oppresses its own people, notably women, and uses those weapons to fight wars in countries like Yemen where 7 million people are starving due to the ongoing conflict. This dynamic in part feeds the complex problem of the 21st century terrorism, which in part creates overreaction and securitization in the west, which leads to further restrictions on our lives – and here we are: we can go the full cycle without finding any simple answers to our issues. Unless we understand the complexities of the global situation, we cannot solve these issues. How we face up to this challenge is our testament to the future world. I would like to go back to the pictures I talked about in the beginning. In the same space there was an exhibition about the time after the revolution here in Russia. Those photos were also full of hope and idealism, but also of repression. I cannot say anything about that, which you would not know better. But it made me think further on utopias, and about what it takes to not only bring people hope, but to make their dreams a reality. Utopias are not built by strong leaders and authoritarian rule. They are built by us, the individuals that are holding on to our dreams. We owe it to the earlier generations to go forward and to build a better society. This cannot happen trough populist movements that claim to defend the people but always betray them. Instead we must look into what is good in us. What are our dreams, hopes and aspirations for the future? How could we build on that? And instead of restrictions and fear, would it be possible to dream of a world that aims for freedom, freedom that is supported by love – for each other and for this world we are living in? Anthropologist Margaret Mead has said something, that I have always found strength in. She said: Never doubt that a small group of thoughtful, committed citizens can change the world; indeed, it's the only thing that ever has. This to me works as a wonderful slogan towards getting organized. It just might take some new means and more political action for the feminist movement to reach that goal!